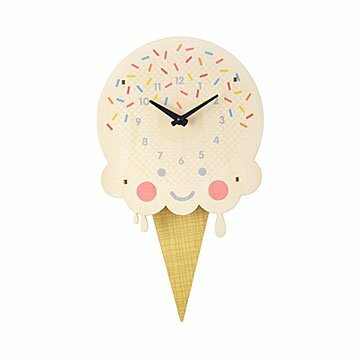 Crafted in the shape of a frozen treat, this clock's pendulum swings with each passing moment. I scream. You scream. We all scream, "What time is it?" Thankfully, this tasty-looking clock holds the answer. Crafted in the shape of everyone's favorite treat (and with an endearing smile, to boot), it sports a pendulum in the shape of a cone that swings with each passing moment. It's made from laser cut Baltic birch plywood printed with non-toxic, water-based inks and comes pre-drilled with a hole for quick hanging, too. Made in Massachusetts. Dust with clean dry cloth. Avoid liquid cleaners. In my granddaughters room to surprise her on her next visit.